GFCI Outlets Do I need One? A GFCI outlet is an electrical outlet which is designed to protect people from deadly electric shock. In addition to preventing electrocution, GFCI outlets can also reduce the risk of house fires caused by electrical problems, and reduce damage to appliances caused by faulty electrical circuits. 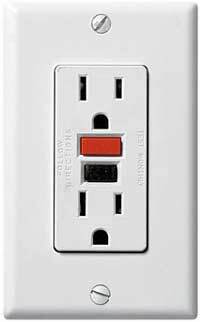 These outlets use ground fault circuit interrupter (GFCI or GFI) technology; it is also possible to install a GFCI at the breaker box, or to use a portable GFCI device. The way in which these outlets work is rather ingenious. The GFCI outlet monitors the flow of energy through the circuit. If an imbalance between the “hot” and “neutral” poles in the circuit occurs, indicating that there is a ground fault, the outlet trips off. Ground faults can be caused by a wide variety of things, including a human being touching an energized part of the circuit, and this can be deadly. A classic example of a ground fault which has been utilized as a plot device in numerous films is a hair dryer which falls into the bathtub, turning the water in the tub into part of the electrical circuit and electrocuting the unfortunate occupant.